A Commission of Inquiry is a hybrid of the judicial and the administrative limb of the state. It is Judicial in the sense that its findings can seriously affect the reputation of a person, though it is not a Court of law as it cannot give a binding verdict. Similarly, it is an administrative organ without the trappings and red-tapism that make them infamous. In essence, it provides for a fact-finding inquiry which reports its findings to the government appointing it – so that the government can be guided by the entire exercise undertaken by a Commission of Inquiry. A Commission of Inquiry is a unique tool in the hands of the government for collection of information without the use of police and other coercive investigation methodologies and agencies. It has high acceptability amongst the public not only because of the stature of persons chairing these Commissions but also because of larger participation of the general public. The Mundhra Enquiry held by Mr. Justice Chagla, which led to the resignation of the then Union Finance Minister, Mr. T.T. Krishnamachari, is well known. Prior to the enactment of the Commissions of Inquiry, 1952, the job used to be entrusted to Committees appointed by Resolutions of Parliament. The working of analogous laws in countries like England, Australia and Canada reinforced the case for a special enactment on the subject. Although modelled largely on the English Tribunals of Inquiry (Evidence) Act, 1921, the experience of its working in England gave its framers in India an idea to give a wider sweep to the Indian enactment than what is visible under English law. However, needless to say, law is not a static phenomenon but is a living organism. It cannot be said that in its present form, the Act has attained the sublime position that it was expected of. However, I am sure that experience and constant improvement would certainly enable the enactment to give the desired results. Commissions of Inquiry appointed by successive governments at the Centre as also in the States have always been contentious – sometimes for the ‘timing’ of their appointment; sometimes for the reason of the ‘definite matter of public importance’ which is sought to be inquired into; sometimes for the reason of the ‘terms of reference’ appointing the Commission of Inquiry; sometimes for the reason of its ‘proceedings’ as they unfold and lastly, sometimes for issues relating to its report and findings. This book is a complete hand-book on the subject. 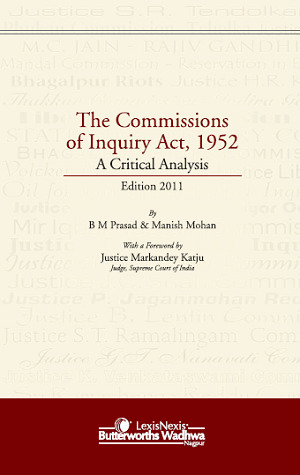 It not only contains a commentary on the subject, but also various connected relevant materials such as notifications of various important Commissions of Inquiry of the past, extracts of connected statutory provisions, report of Law Commission of India and report of the Royal Commission on Tribunals of Inquiry Act, 1966.